The entirety of Hollywood Boulevard stretches just under five miles from Sunset Boulevard in the Silver Lake area to the east and ending by the Hollywood Hills in West Hollywood. The most famous stretch is the Hollywood Walk of Fame and the nearby passel of landmarks that are located in a 1.3-mile area from La Brea Avenue to Gower Street. During the 1930s, Hollywood Blvd was the center of glamor, lined with palatial stage and movie theaters like TCL/Grauman's Chinese, the Egyptian near Hollywood and Highland and the Pantages Theatre at Hollywood and Vine. In the 1960s, the area fell on hard times and was known more for sleazy strip shows, prostitution, and drug culture until the 1990s. At the turn-of-the-millennium, redevelopment breathed new life into the Boulevard, anchored by the Hollywood & Highland Center, which opened at that intersection in 2001. A crackdown on crime moved most of the criminal element out of the neighborhood, making it a mecca for tourism. While there remains a segment of seediness in the area, there is a consistent police presence to keep visitors safe. Most of the attractions on Hollywood Boulevard are near the intersection of Hollywood and Highland, with nightclubs and restaurants scattered loosely down the street to another cluster at Hollywood and Vine. In 2009, the W Hotel opened at Hollywood and Vine across from the 1930 Pantages Theatre, bringing a new nightclub and restaurant to join the longstanding Avalon nightclub in the Palace Theatre Building. Visible from the intersection of Hollywood & Vine is the iconic Capitol Records Building, just north on Vine Street. The Hollywood & Highland Center incorporates the historic ITC/Grauman's Chinese Theatre on its southwest corner, as well as the Dolby Theatre, (formerly the Kodak Theatre), the permanent home of the Academy Awards. A mix of retail, dining, and entertainment venues around the central Babylon Courtyard, which is modeled after a set from D.W. Griffith's 1916 historic epic film "Intolerance." Hollywood & Highland also includes the Renaissance Hollywood Hotel. Further east of Gower Street, where the Walk of Fame ends, Hollywood Boulevard passes through Thai Town and Little Armenia, both home to some great budget ethnic food. The revitalization of the area brought the opening of nightclubs and restaurants, many co-owned by Hollywood celebrities, alongside the ubiquitous lingerie shops on Hollywood Boulevard. Doormen (and women) at Hollywood hot spots keep tight control of who passes the velvet ropes. In the vicinity of Hollywood & Highland are all family-friendly (if kitschy) attractions that stay open late. Madame Tussauds Hollywood wax museum moved in next to Grauman's Chinese Theatre in 2009, joining the Hollywood Wax Museum, Ripley's Believe it or Not Odditorium, the Guinness World Records Museum and the Hollywood Museum, which is good for teens, but not young children. Disney's El Capitan Theatre and the Disney Soda Fountain and Studio Store, provide additional family entertainment options. The costumed characters in front of Hollywood & Highland offer a fun photo opportunity for kids, but don't forget to stock up on dollar bills to tip the actors. The nearest freeway to Hollywood Boulevard is the 101 Hollywood Freeway which flows northwest from Downtown LA with multiple exits that give easy access to Hollywood Blvd. The Hollywood Blvd. exit is near Van Ness in East Hollywood and the Gower Street exit is near Hollywood and Vine. The Cahuenga Blvd. exit is north of Hollywood Blvd half-way between Vine and Highland while the Highland Street exit is north of Hollywood Blvd. near the Hollywood Bowl and Hollywood. & Highland Center. This Cahuenga exit is often jammed on a Saturday at midnight with club goers, so one of the other exits may be a better option at that time of day. The Metro Red Line runs along Hollywood Blvd for three stations. Northwest-bound from Downtown LA, the stations are located at Western, Vine and Highland. The Red Line continues north to Universal Studios Hollywood and North Hollywood. The Red Line connects in Downtown LA to Metro service to Long Beach, Pasadena, and LAX. A variety of Metro and city LADOT buses provide service along Hollywood Boulevard. If you love the outdoors, take a hike into Runyon Canyon in the Hollywood Hills. The park entrance and trailhead are just 4 blocks from the La Brea end of the Walk of Fame at the north end of North Fuller Ave. The trail offers a great view over Hollywood and visitors might just run into a movie star. Get up-close to the entertainment business by catching a TV Show Taping with Jimmy Kimmel Live filming inside the Disney Entertainment Center. 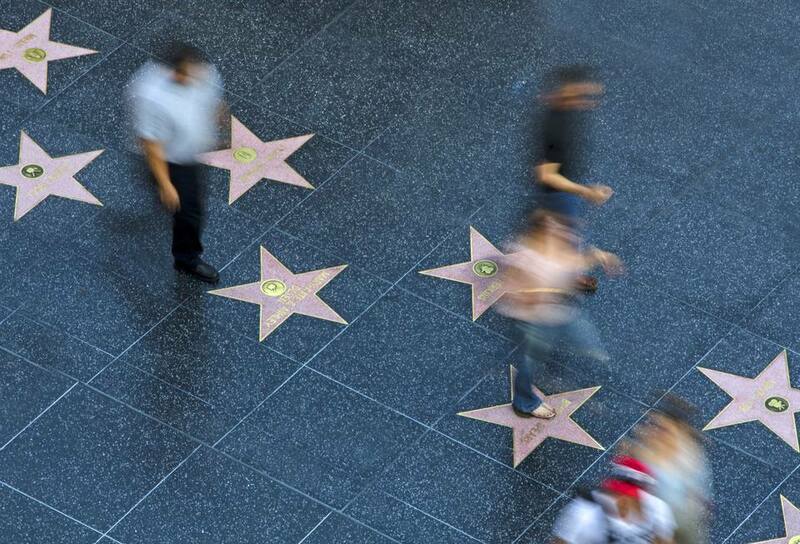 A unique souvenir to take back home is getting your name on a star on the Walk of Fame at Starring You.